West Ham’s final season at the Boleyn Ground was always going to be memorable. It featured a new manager in Slaven Bilic, the arrival of a French magician called Dimitri Payet and away wins at Arsenal, Liverpool and Man City – not to mention an unexpected tilt at the top four and an epic last game at the Boleyn against Man United. But a new beginning is around the corner and, as he and his fellow Hammers prepare to swap the gritty East End streets of E13 for the shiny shopping centres of Stratford, lifelong supporter Pete May reflects on the special place the Boleyn Ground has occupied in the hearts of generations of Irons fans. 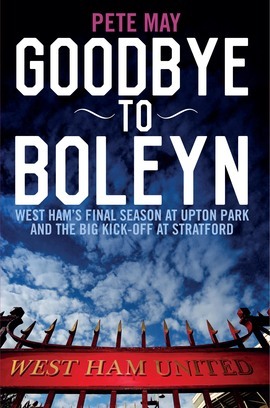 Whether it’s the infamous chants of the Bobby Moore Stand, the pre-match fry-ups at Ken’s Café or the joys of sticky carpets, rubbish ale and blokes singing on pool tables in the pubs around Upton Park, Pete’s memories are sure to resonate with legions of the claret-and-blue army as they say farewell to the Boleyn and enter a new era at the London Stadium.